Supported OS: Mac OS X 10.14 (Mojave), 10.13 (High Sierra), 10.12 - 10.6. You can use Aimersoft Video Converter Ultimate for commercial use. What is Aimersoft Video Converter Ultimate for Mac? 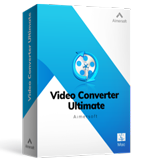 Aimersoft Video Converter Ultimate for Mac is the latest version of Aimersoft video converter software. It's the most value of money video solution Aimersoft offers. It combines video converter, video downloader, video editor, video compressor, DVD burner, CD burner, screen recorder, metadata editor, and more features. What’s the difference between a personal license and a business license? You can purchase the personal license if you are planning to use the video converter for non-commercial purposes at home. While the business license is designed for commercial use in a business environment. The personal version of the video converter has the same functions as the business version's except that the product description is different. My company wants to purchase Aimersfot in volume. How do I get started? If you have a business and need to manage just a few licenses among users, the business licenses available online might be a good option and can be purchased directly. For larger businesses and enterprises that have more complex deployment and administrative needs, see our volume licensing options. You can Request a contact from Aimersoft Enterprise sales. If you meet technical or other problems that cannot be solved, you can get a complete refund of your purchase price within 30 days. Check our Refund Policy to find out if you are eligible for a full refund.